Whereas most agencies claim to know everything about everywhere the Camden Bus is different, concentrating true knowledge in a defined area. Charles Christie-Webb founded the Camden Bus over 30 years ago. He knows and understands the property market and has intimate knowledge of this specific location. When TV or radio companies need the help of a local property expert, they regularly come to Charles. 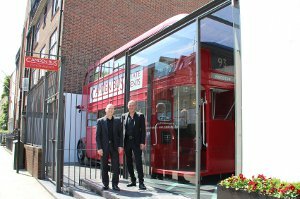 The Camden Bus is a skilled team; all property professionals in their own right and not one j Read full description...Whereas most agencies claim to know everything about everywhere the Camden Bus is different, concentrating true knowledge in a defined area. The Camden Bus is a skilled team; all property professionals in their own right and not one junior amongst them. Gary Lazarus has directed all the valuations and sales since 1992. Possibly because we've always been a close-knit team, our method of selling homes is enjoyable and efficient. We recognize the value of long-term business; when you buy a property through us, we'll strive to ensure you return to us as a seller. If you're excited about moving to Camden Town, then let us share our enthusiasm of why we call it home. Contact the office by phone or email.